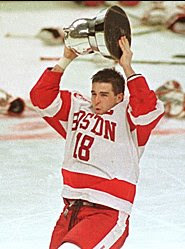 The 57th Annual Beanpot Tournament is five days away, and despite the presence of a league game, BU’s rematch with Merrimack, on the schedule this Friday, excitement over Boston’s annual “city championship” event is building. This week' program will be broadcast from Brandy Pete’s in Boston’s Financial district. Fans are invited to attend have their photo taken with the Beanpot. Bring a camera. NESN will air its one-hour program “The Beanpot - Boston's Tournament" on Jan. 21 at 6 p.m., Jan. 28 at 3 p.m., Feb. 1 at 7 p.m., Feb. 2 at 4 p.m., Feb. 3 at 7 p.m., Feb. 4 at 2:30 p.m., Feb. 6 at 5:30 p.m. The New Jersey Devils are in town to play the Bruins tomorrow and are practicing at Agganis Arena today. Also in town from the Metro New York area is an MSG Network crew, doing a feature story on former BU captain and All-American--and currently Rangers captain--Chris Drury. 2009 recruit Justin Courtnall followed up this past weekend’s hattrick with a two-goal effort last night in Victoria’s 6-3 win over Alberni Valley. The win keeps the Grizzlies in first place in the Island Division of the BCHL’s Coastal Conference, just behind Salmon Arm for the overall league lead. Courtnall’s 2 goals give him 52 points, one more than his 51 last season, and good for 18th in BCHL scoring. The Buzz: Wilson has been virtually unstoppable since returning from his stint with the U.S. team at the World Junior Championship. In six games in January, Wilson has 2-7—9 and his current five-game point streak matches his season best in that department. And like it or not, the Beanpot Tournament, which starts Monday – BU opens against defensively challenged Harvard – is arguably the biggest regular-season event in college hockey. A strong showing there can enhance Wilson's chances greatly.